We asked on Facebook…. We did an online survey... You guys spoke… and we listened. We now offer numbing gel and spray for an almost Pain free tattoo experience. It’s ok if you still want your friends to think you’re a badass we won’t tell a soul! There's a new tattoo anesthetic in town that's worth knowing: Recovery Numb Tattoo Anesthetic Cream. 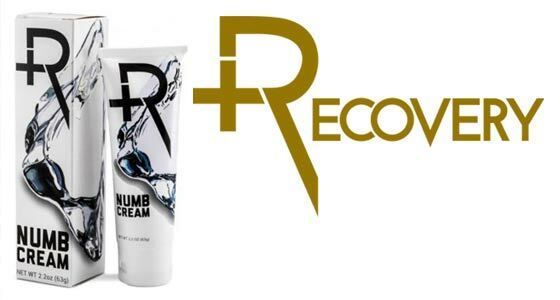 This newest addition to the Recovery Aftercare line covers the "prep" in their motto "Prep | Modify | Heal". With its 5% lidocaine base, Recovery Numb can prep you or your clients for a more comfortable tattooing experience. Some people feel the pain of getting a tattoo is a sacred part of the process, but not everyone can handle it. It's better to offer clients with low pain thresholds a quality tattoo anesthetic then to ask them to power through and battle their cringing throughout the process. Recovery Numb is the perfect option for clients who need pain relief, because it contains the maximum amount of lidocaine the FDA allows in over-the-counter topical anesthetics. It's comprised of a highly-effective formula that reduces inflammation, eases pain for up to six hours, and starts acting within 15 minutes of application. Recovery Numb Tattoo Anesthetic Cream is a vegan-friendly numbing cream that's manufactured in the U.S. It can be used to numb clients before laser tattoo removal, cosmetic procedures, minimally-invasive aesthetic procedures, and piercings in addition to tattoos. Recovery Numb is designed for pre-application and should be applied before the tattoo procedure. To use, simply apply Recovery Numb liberally on entire area to be tattooed one hour before the procedure. For best results apply a thick layer. Next, seal in the product in by wrapping the area in plastic. Please leave plastic on and let your artist remove prior to tattooing. Derma Numb Tattoo Anesthetic Spray uses a proven formula that will ensure your tattoo experience will be as enjoyable as possible. Finish a tattoo that would normally take two sessions, in one. 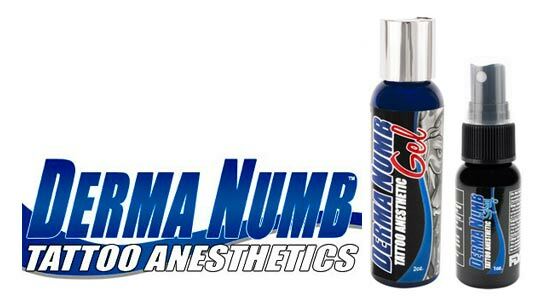 Derma Numb only uses the finest ingredients possible to provide the best possible option in topical anesthetics. Utilizing the top two natural numbing agents along with lidocaine, Derma Numb is an excellent anesthetic. Two other ingredients are the natural yarrow root and yucca glauca root, which have been used by Native Americans for centuries for healing wounds. Not only do these roots have healing capabilities, they are used for numbing, skin cell rejuvenation, sterilizing, and as an anti-inflammatory. You buy it and your artist will use it during your procedure to take the edge off. Once skin is broken or outline is done, your artist will spray Derma Numb generously over tattoo area. Wait 90 seconds for anesthetic to take effect, re-apply Derma Numb as needed throughout the tattoo process. *Remember, these numbing products do not guarantee that your tattoo procedure will be absolutely pain-free as to every individual's body chemistry is different from one another. These products are used to make a more comfortable experience and ease the pain from getting tattooed.